IFF Benicarló, a subsidiary of International Flavors & Fragrances (IFF), a company that produces and supplies fragrance ingredients, has won this year´s annual Industrial Excellence Award, which is granted each year by the Celsa Group™ and IESE business school. The award recognizes the work of industrial companies whose strategies contribute to the competitiveness of the Spanish economy. International Flavors & Fragrances (IFF) has received the Industrial Excellence Award due to an outstanding industrial strategy that has contributed to Spain´s economic competitiveness in 2018. The Industrial Excellence Award 2018, which is promoted by Celsa Group™ – the leading Spanish steel group – together with the top-rated business school, IESE, highlights how IFF´s strategy is based on solid values that are consistently aligned with both its industrial and commercial areas. The jury particularly singled out for praise IFF’s high levels of operational excellence, its passion and focus for innovation (which has led the company to attract important strategic investments), its emphasis on continuous improvement, its commitment to sustainability and its corporate culture, which allows it to bring out the best in its people. IFF will now represent Spain to compete for the Industrial Excellence Award Europe, against corporations in other countries such as France, Germany, the Netherlands, Turkey and the U.K. The other three finalists of this edition are (in alphabetical order): Clickedu, a platform in the cloud that is present in more than 600 schools, and which allows the integrated management of an educational center; Dara-Pharm, a company that designs, manufactures and markets automatic process and packaging machinery for the pharmaceutical, biotechnology and cosmetics industries; and Logisfashion, a logistics operator specialized in providing integral and global service to companies in the fashion sector. 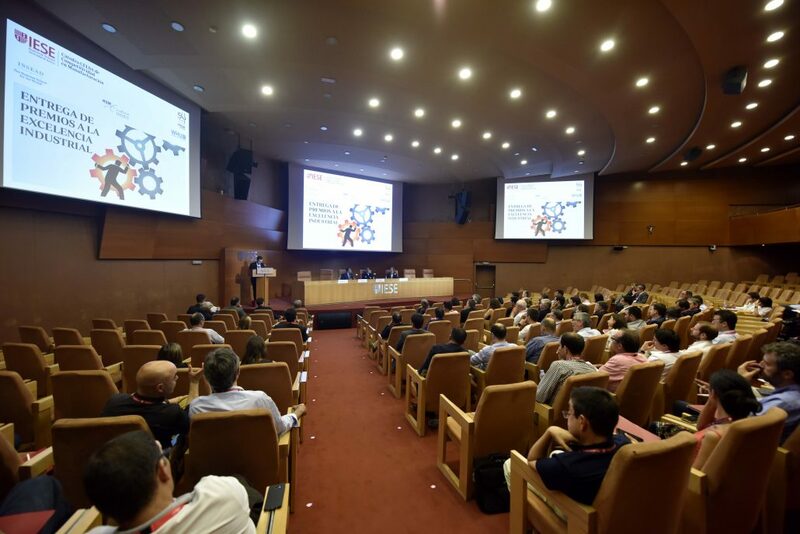 IESE professor Eduard Calvo opened this year’s event, followed by Ramón Pastor, Vice President and General Manager of HP, who talked about 3D printing technology and its implications in the processes of production and design of new products. The event was also attended by the dean of IESE Business School, Franz Heukamp, and the president of the Celsa Group, Francesc Rubiralta. Francesc Rubiralta thanked the participants for their “contribution to the dynamism of our country’s economy” and recalled that Celsa Group™ and IESE, through the Celsa Chair of Competitiveness in Manufacturing, have been leading the Industrial Excellence Award initiative in Spain for many years. 2017: Mahou San Miguel (winner); Jeanology and TMB Bus (finalists). 2016: Seat Components (winner); Aciturri Aeronáutica, Lilly Alcobendas, Continental Rubí (finalists). 2015: Mayoral Children’s Fashion (winner); Essilor, Europac Packaging (finalists). 2014: Volkswagen Navarra (winner); Gonvarri Steel Services (finalist). 2013: Orkli (winner); Acorn Agrisolutions, Ormazabal (finalists). 2012: Aernnova (winner); Alzamora Packaging, Europastry, Volkswagen Navarra (finalists). 2011: John Deere Ibérica (winner); Bunge, Covap, Huf, Macsa Id (finalists). 2010: Ficosa (winner); Codorníu, Ega Master, Igeotest, Vestas (finalists). 2009: Martínez Loriente (winner); Comdipunt, Esteve, La Farga Lacambra, Sara Lee, Seat (finalists). The CELSA Chair of Competitiveness in Manufacturing was created with the aim of producing research, generating ideas and disseminating knowledge in the area of competitiveness in the industrial sector. As a result of this commitment, the CELSA Chair of IESE develops powerful research on the industrial sector and its competitiveness, and, since 2009, rewards the best factories in Spain. More information. IESE, the graduate business school of the University of Navarra, is one of the world’s most international business schools, with campuses in Barcelona, Madrid, Munich, New York and São Paulo. IESE has pioneered business education in Europe since its founding in 1958 in Barcelona. The mission of IESE is to train leaders who can have a positive and lasting impact on people, companies and society thanks to their professionalism, integrity and spirit of service. During its 60 years of history, it has received numerous international awards for its teaching and research work. In the last four years, IESE has positioned itself as number 1 in the world in Executive Education programs, according to the Financial Times ranking. Celsa Group ™ is the leading Spanish private steel group and the third largest manufacturer of long steel products in Europe. The multinational consists of six large business groups with steel mills, rolling mills, transformer plants, distribution companies and recyclers. It has more than 9,100 employees around the world and is present industrially in Denmark, Finland, France, Norway, Poland, Spain, Sweden and the United Kingdom.